It seems that the Michael Bay produced Teenage Mutant Ninja Turtles will be getting a sequel so I thought it would be worthwhile to take about a little geek etiquette. If you are feeling blue about your classic cartoon being turned into a “awful film” then just remember. Maybe one day there will be a good Turtles movie. After all, Joel Schumacher made Batman and Robin, but we later got The Dark Knight. If the characters are good we’ll eventually get a good movie. But there is something you can do right now: vote with your dollars. I cannot stress the importance of voting with your dollars. If you see something that you are skeptical about don’t see it in theaters. Don’t give me that whole, “Well you never know if you are going to like something until you see it” No, stop it, your wrong. But if you are REALLY curious just wait. Just wait until you get the chance to see for free, because if you give money to it, it will continue. I worked on the movie and feel I have every right to see it without judgement, but I just don’t see myself going through with it and seeing it. I know I will never convince everyone to refrain from the movie so I have another solution. Buy a ticket to another movie you liked. If I decide that I am too curious, and that I must see turtles I will simply vote with my dollars. I will buy a ticket for a movie I already saw and liked and then sneak into the movie I don’t want to reward. I will buy a ticket for Guardians of the Galaxy or Boyhood (movies I already paid money to see, but want to support more) and then I can sneak into Teenage Mutant Ninja Turtles. Thus seeing the movie, but not giving the people responsible any money for a sequel. Currently I’m trying to coin this act, I don’t know like “Double Dollar Ditching” or “Side Screening” I don’t know I’ll think of something later. If you think of something let me know. 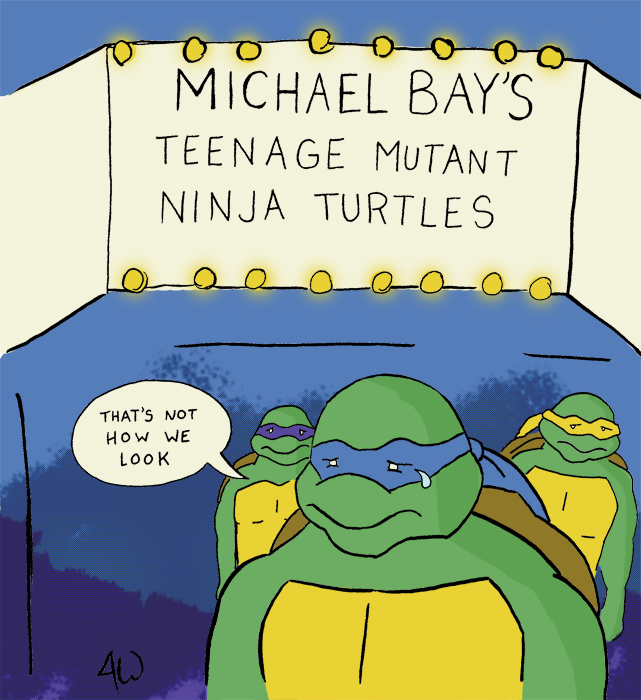 So I don’t know, go see Teenage Mutant Ninja Turtles, just buy a ticket to something else.